„That the Buddhas protect persons of shinjin is truly beyond doubt”. 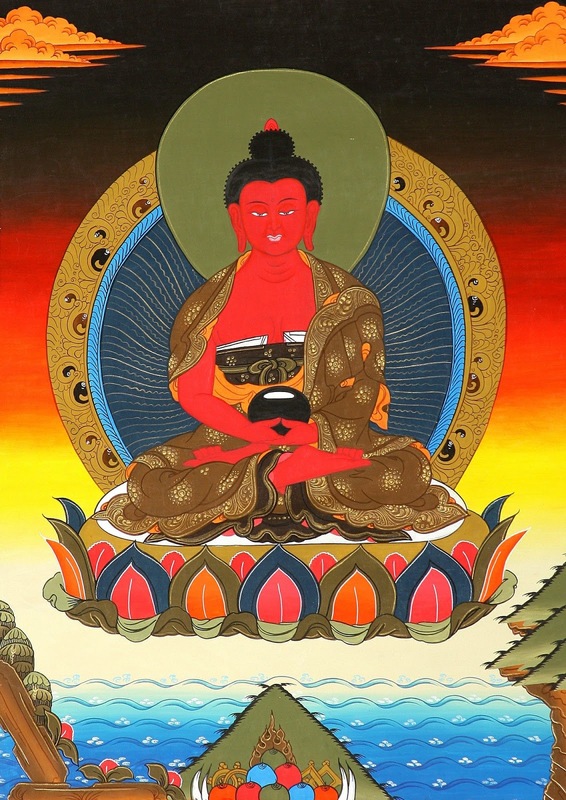 "When you singlemindedly recite Amida’s Name, Avalokitesvara and Mahasthamaprapta will always follow you and protect you, just as shadows follow objects. They are like your close friends and teachers". Accompany us just as shadows do things. Rejoice in and protect us." "Amida and a vast and numberless saintly host, consisting of innumerable manifestation-bodies of Buddhas, of Avalokitesvara, and of Mahasthamaprapta, appear in person to be alongside and always protect those who have realized true and real shinjin, at all times and in all places". „Since persons of true shinjin are guarded in this world, the Smaller Sutra of Immeasurable Life speaks of 'the protection of the countless Buddhas in the ten quarters'. This does not mean that they guard such persons after birth into the Pure Land of peace, but rather that they watch over them with protecting thoughts while such persons are still in this Saha world." "'There are sentient beings who solely think on Amida Buddha; only these people are constantly illumined by the Light of that Buddha's heart, grasped and protected, never to be abandoned. It is not at all stated that any practicers of various other acts are illumined and embraced. This is being protected in the present life, a manifestation of the decisive cause of birth in the Pure Land'. "'There are sentient beings who solely think on Amida Buddha': signifies entrusting oneself with wholeness of heart to Amida Buddha. 'These people are constantly illumined': 'constantly' means ever, without pause. 'Without pause': the person of true and real shinjin (faith) is ever illumined and protected, at all times and places. Since he or she is constantly protected without pause by the heart of Amida, this Buddha is called the Buddha of Unceasing Light. „'Protected' means that one cannot be deterred by those who have taken up other teachings and beliefs, nor obstructed by those of different understandings and practices”. "To practicers who have realized shinjin, nonbuddhists present no obstruction." There were some non-Buddhists in my life who tried to convince me that I will go to hell because of not following their religion. Of course, such attempts to frighten me failed not because I posses some special powers, but because my faith (shinjin) is not an intelectual creation which sometimes I have and at other times I don’t. Is incapable of reaching fulfillment. Reveals how difficult it is to attain". Supreme shinjin that is true and real." „Shinjin is bestowed through the compassionate means of Sakyamuni, Amida, and all the Buddhas in the ten quarters”. As all Buddhas are involved in the process of our entrusting to Amida, it’s logical that they will never leave us after we actually entrust to Amida Buddha. „'Never to be abandoned': these words teach us that the person of shinjin is embraced and protected by the heart of the Buddha of Wisdom-Light and that he or she is never abandoned, but always resides within that heart of light. 'It is not stated at all that any practicers of various other acts are illumined and embraced': 'various other acts' signifies all the various kinds of good acts. Thus, it is not the case that any who perform sundry practices and incline toward different forms of discipline are illumined and embraced; they are not protected. This sentence urges us to realize that such people do not receive the benefit of being grasped by Amida, for they are not practicers of the Primal Vow. It means that they are not protected in the present life. 'This is being protected in the present life' means that Amida protects us in this world. This karmic power of the Buddha, fulfilled through the Primal Vow, is the strong cause of the attainment of Birth by the person of shinjin; hence it is called the decisive cause".
" The merit of protection by Amida Buddha is received in daily life. This is because one who has genuine belief in birth in the Pure Land holds no doubt. Amida Buddha casts eighty-four thousand rays of His Light of compassion upon one who is resolute in the attainment of this goal. Amida Buddha shines this Light continually on the nembutsu practitioner in daily life and up to the final moment of that person's life. For this reason, it is called the 'Vow by which Amida Buddha never abandons the nembutsu devotee." Amida's Light represents the working and the wish of Amida Buddha to save (lead to Buddhahood) all sentient beings drowned in delusion. The manifestation of this work and wish is His Primal Vow. Amida’s Light is a permanent presence upon beings everywhere, opened or not opened to it. Through His Light Amida tries permanently to influence beings and make them accept His salvation contained in the Primal Vow. It is like an immense magnet attracting all beings to Him. Some become opened to it sooner while others will do so in the future, but Amida will continue sending it until all samsaric realms become empty and all beings attain Buddhahood. However, if one is not yet opened to Amida’s Light (His Primal Vow) one cannot benefit from the blessings and protection this Light gives during the present life. This is why Shinran said, „such people do not receive the benefit of being grasped by Amida, for they are not practicers of the Primal Vow”. The path of birth in the Pure Land is stated clearly by Amida in His Primal Vow: „entrust yourself to me, say my Name and wish to be born in my land”. If people do other practices than the above three recquirements, that is, if they are ‚practicers of various other acts” or if they „perform sundry practices and incline toward different forms of discipline” (other Buddhist or non-Buddhist methods) if they rely on their self power to attain birth in the Pure Land or if they have the goal of attaining Buddhahood in the present life, etc, then they do not benefit from the protection of Amida’s Light. This is not because Amida is angry at them for not following His Primal Vow, but because they refuse to make the karmic connection with Him that will make them being born in His Land. By closing their minds to Amida’s method of salvation, they cannot benefit from what Amida is offering to them. The path leading to birth in the fulfilled land of the Pure Land is made up exclusively of : „entrust yourself to me (Amida), say my Name and wish to be born in my land”. Anything else leads to various other places or realisations, but not to the Pure Land, so its logical that they cannot benefit from the protection and guidance of the Master of the Pure Land. “I still don’t understand how a person is ‚protected’ by these various Buddhas and by Amida if a person’s karma can’t be changed in the present life”. In the moment you entrust to Amida Buddha your karma has its root cut off or sterilyzed, in the sense that it cannot plant its seeds into another life – that is, you will no longer be subject to birth and death. But in this life you continue to experience the effects of your past actions from previous lives or of those actions you commit until the moment of death. So, we should not make any confusion and think that after we receive shinjin we should always be happy or always experience happy circumstances. Since, with shinjin, we are protected from rebirth in the unenlightened states of existence, no being (visible or invisible) can destroy our faith or divert us from the Buddhist path, and the attainment of Buddhahood in the Pure Land is guaranteed. These are some ways through which the benefits of being protected and cared for by all the Buddhas and of being protected by the Light of Amida’s heart manifest themselves. The expression “sons and daughters of good families” means males and females disciples of Buddha. Because people tend to dismiss the path of birth in the Pure Land through simple faith in Amida as being too easy to be true, all Buddhas give testimony to it, thus attesting to the effectiveness of this path its utmost importance.